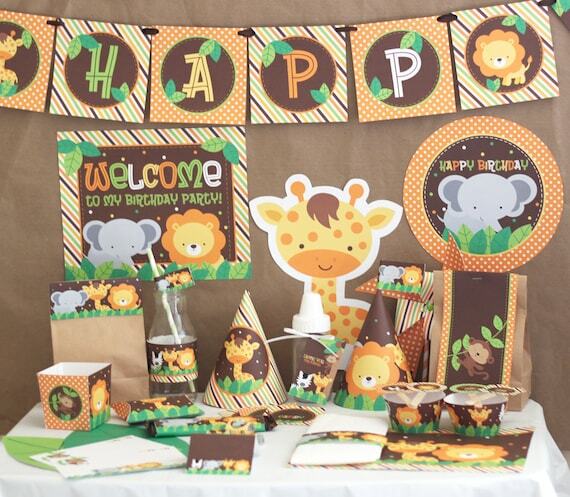 Printable Jungle Safari Birthday Party Decorations by Stockberry Studio. If your interested in this option the additional fee is $10 NAME PERSONALIZATION. Please select this option in the drop down menu before adding it to your cart. And leave a note in the note to seller section when checking out with the kids name and age for personalizing the party kit. The NAME PERSONALIZATION will take about 2-3 business days (Monday-Friday Eastern Standard Time) to complete. ***RUSH ORDERS:*** If you need the Name Personalization sooner then 2-3 business (Monday-Friday Eastern Standard Time) days a rush fee will apply. Please send an Etsy Conversation message for details. ALL PARTY PRINTABLE PACKAGES ARE FOR PERSONAL USE ONLY and CAN NOT be resold for any purpose.